Mindmap updated for 30 March 2014.
haha Every time I look at my mindmap anymore, I am reminded of the skill system from Final Fantasy X. Grid sphere system from Final Fantasy X. Image hosted on the website The Philippine Final Fantasy Portal. The grid sphere system, especially upon first sight, sprawls out like some curled serpent moments from waking. 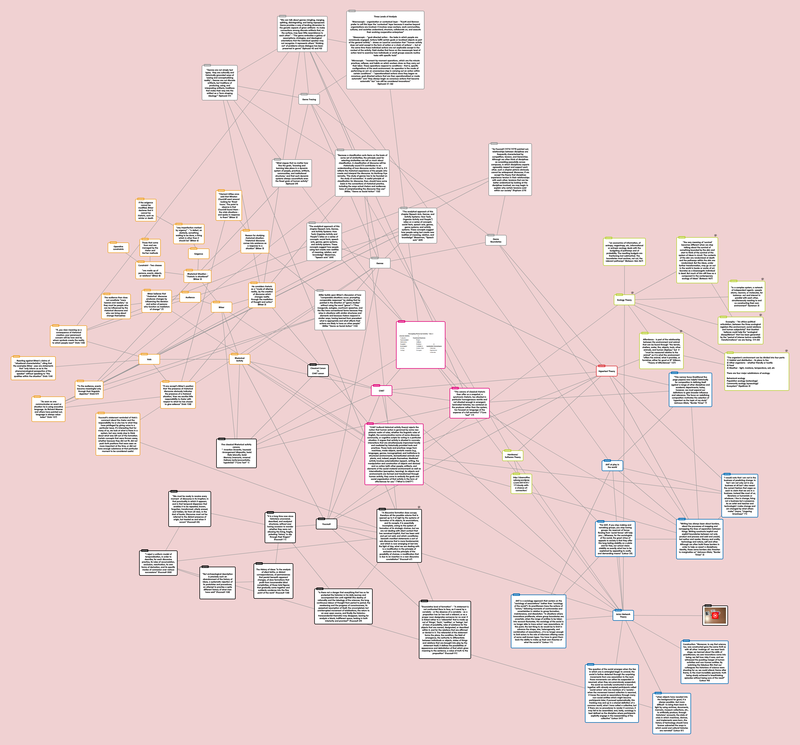 The more I look at my mindmap, the more impressed I am by how large it has gotten in the last three months. For my own sanity, I keep a mindmap drawn on paper with the overarching theories drawn on it. But, enough about that. Time to talk about what I have added, my three nodes and my little links between them. This week continued Ecology Theory, with Felix Guattari’s Three Ecologies, Frank Spellman’s Ecology for Nonecology, and Margaret Syverson’s Wealth of Reality. This week’s additions were a bit easier since I had already laid the ground work for Ecology nodes. So, what did I add? First things first. A definition of Guattari’s term ecosophy – “‘An ethico-political articulation…between the three ecological registers (the environment, social relations and human subjectivity)’ that Guattari believes could help the ‘ecological disequilibrium’ that has been generated by the ‘period of intense techno-scientific transformations’ we are facing (19-20).” I wanted to make sure I had this in my mindmap because it gives me an idea of what ecology theorists may want to do with their theories. Why link ecology to computer systems and politics, why have so many texts that try to make sure people know just how inextricably connected we are to all the ecosystems we don’t think about? Guattari’s text may be short, but it gave me a lot to think about. This was another thing I wanted to be sure to add as it dealt with concepts I had read about in the prior week with Gibson and Bateson, drawing in information played out in the video on the Cary Institute’s website. Here, there were habitats, affordances, and neighboring ecosystems, but also the subdivisons that make up an environment with the different kinds of ecologies. I linked this node to a node I had made for Gibson’s “Theories of Affordances,” which I think linked to a node about CHAT’s creators defining what CHAT is supposed to be: “As objects and environments are formed and transformed through human activity, they come to embody the goals and social organization of that activity in the form of affordances for use.” The Ecology Theories we have been reading give me more perspective on what “affordances” meant (something I wasn’t totally sure about before), but also gave me the understanding that this definition of CHAT is looking at the modification that Bateson and Gibson had been discussing. This was hindsight leading me down new rabbit holes. For my last node of the week, I pulled from Syverson’s text: “In a complex system, a network of independent agents–people atoms, neurons, or molecules, for instance–act and interact in parallel with each other, simultaneously reacting to and co-constructing their own environment” (3). This quote reminded me a lot of Foucault’s discussion of the physician and the role the physician plays being dependent upon everything going on in the field around him or her. The complex system that Syverson is discussing is more organic than the constant restructuring of the medical field with advancements in technology and anatomical understanding, but it was the idea of “simultaneously reacting to and co-constructing their own environment” that seemed to underlie the constant cycle and layering of discursive statements that populate history. Is this what was meant by Bateson’s cybernetic epistemology and ecology of the mind? This entry was posted in ENGL894, Mindmap and tagged Connections, Ecology Theory, Ecosophy, Ecosystem, ENGL 894, Guttari, Mindmap, Networks, Nodes, Spellman, Syverson, Update. Bookmark the permalink. Love the connection between Bateson and what Svyerson was looking at.